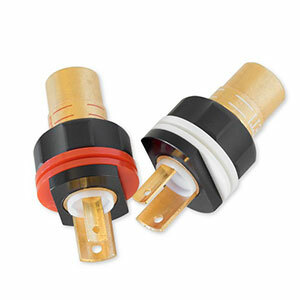 The Newest Female RCA Connector socket from ETI Research: The FR-TC07. The new FR-TC07 female RCAS socket performs at the same trailblazing level as the legendary ETI Research Phonopod, but with some added benefits. High ﬁdelity performance has been achieved with the ETI Research without giving into compromise. The ETI FR-TC07 RCA socket has an open and airy, coherent musical presentation that doesn't pull any 'meat off the bone', in doing do. The design has low self-inductance, is optimized to eliminate RF reﬂections, easy installation, and unfailing durability. Frequency bandwidth is also unparalleled. Each pair is offered with RED and WHITE color code (1 piece each). Lengths and masses of signal pin and return pin connections are optimized to maintain durability. Low mass signal conductor is made from Pure Copper superior, extended bandwidth, better high-frequency response, and better sound. Matched to the thinnest possible Tellurium Copper, the low mass ground outer shell is optimized to transmit the ground signal in a most optimal manner. Non-magnetic, Brass Nut that offers exceptional vibration damping and excellent EMI/RF noise rejection. The nut screws onto a Polymer thread, so there is zero electrical contact with the Signal. – no Nickel, no Brass, no Bronze – for extreme conductivity and the best signal transfer.